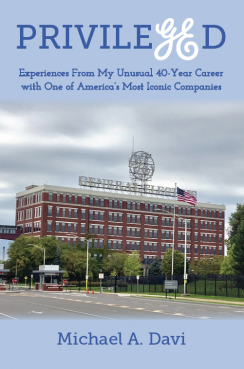 Bursting with interesting and uncanny experiences, Michael A. Davi outlines a most unusual 40-year professional career with one of the most iconic companies in America. He begins his tale with some carefully researched stories of his four immigrant grandparents, each of whom was employed by GE at some point in their lives. As the first in his family to graduate college, earning an engineering degree, Davi was able to open doors that neither he nor his grandparents ever would have dreamed possible. Extraordinary work assignments, business travel across four continents, flights aboard corporate jets, and opportunities to work alongside some of the top talent in the company are all part of the story. His tale is brimming with fascinating characters, global adventure, drama, success, tragedy, disappointments and rebounds. Through highs and lows, noting lessons along the way, Davi’s story truly captures his unique experience of the American Dream.